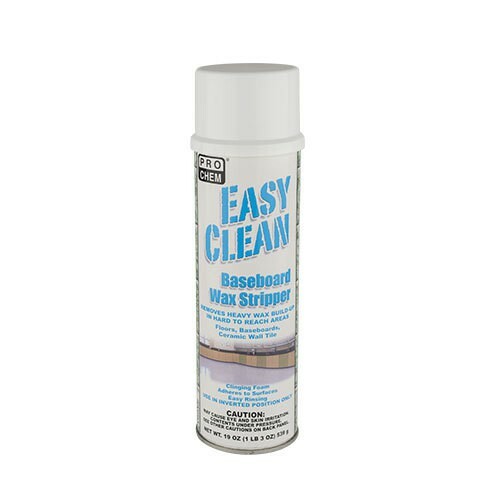 EASY CLEAN | Pro Chem, Inc.
EASY CLEAN is a high power, foaming cleaner that clings to baseboards to provide easy removal of soil, wax and copolymer floor finishes. This unique formula provides increased cleaning action and is easy to rinse. Special nozzle sprays upside-down so you can spray while walking along the edges of baseboards. Shake well before using. Use in upside down position only. Spray, holding can approximately 6 to 10 inches from baseboard or surface to be cleaned. Apply in a thin, even coating that covers the soil and wax. Allow product to remain on surface for 3 to 5 minutes. Wipe away residue with wet sponge. For stubborn films, rub the area with a wet scrub pad and then sponge away residue. Note: May dull some painted surfaces if allowed to set. It is best to quickly remove any overspray.